A practical, easy-to-use guide for adults working withelementary age children! This resource focuses on how to live a life of faith in the world today. Activities center on a scripture verse children can read and memorize thatengage children's senses. Adults will have minimal preparation time andactivities are designed to enhancethe spiritual growth ofchildren. It includes suggestions on how to adapt the activities to include preschool children. 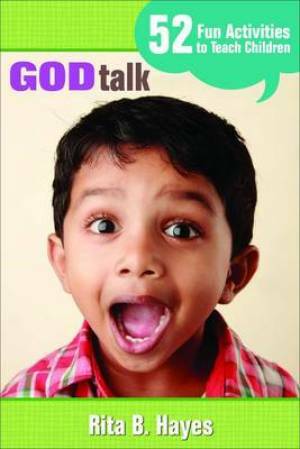 God Talk : 52 Fun Activities To Teach Children by Rita B. Hays was published by Abingdon Press in September 2011 and is our 37740th best seller. The ISBN for God Talk : 52 Fun Activities To Teach Children is 9781426736155. Be the first to review God Talk : 52 Fun Activities To Teach Children! Got a question? No problem! Just click here to ask us about God Talk : 52 Fun Activities To Teach Children.